WASHINGTON (CNN) - While reaching out to supporters through one of the latest high-tech means, President Obama expanded his social media experience by holding a Google+ video chat room interview on Monday afternoon. In an election year, it's probably not good politics to talk about what you look forward to doing after your time in the White House, but that's exactly what President Obama did when asked about the frustrations of living in the security bubble. "It's the toughest thing about being president. Look, this is the greatest job on Earth and it's such an honor to serve, but it is true sometimes, you get a little stir crazy," he said. "One of the things I look forward to after I've had this extraordinary honor is just taking a walk, or waking up on Saturday morning, not shaving and going to the local Starbucks and not having to worry about it." The president was also asked to sing and dance, (which he refused) to say hello to one of the questioners' young children, and from an Obama impersonator a question about the impact of comedy sketches on the election. "I don't know if any of this stuff affects an election, but I know that it makes our country stronger that you can make fun of the president - or anybody - and everybody can get a laugh," President Obama said. "And that also makes sure to remind me that I work for you guys." Most of the forum, which came in the form of live video connections and video YouTube questions, focused on the economy. "We're starting to see some signs that the economy is picking up. We've created 3 million jobs over 22 months and we saw the largest boost in manufacturing jobs that we've seen since the '90s. Best job growth we've seen since 2005. But we've still got a lot more to do," President Obama said. "I have to keep this recovery going, that's why it's so important for us to extend the payroll tax cut." 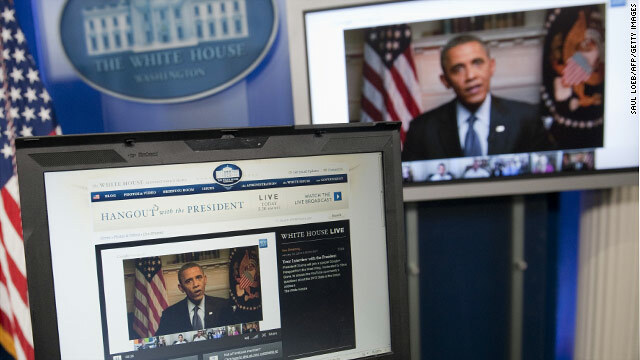 The live video chat room included five Americans in cities across the country. Participants were able to follow up with the president after his answers in real time. Jennifer Wedel in Fort Worth, Texas, asked the president why the government continues to extend visas for immigrant workers when there are many people, like her husband, who have been out of work. President Obama offered to look at her husband's resume to help him find an engineering job. "Forward me his resume," he told her. "The word we're getting is someone in that high-tech field should be able to find something right away. I want to follow up on that." The questions were chosen by Google team members from among the most top-rated of those submitted. Google maintains the White House had no role in the selection of the participants. Obama also held a similar Facebook town hall at the Web giant's headquarters in Palo Alto, California, in the spring, and a YouTube town hall at the White House in February. « Previous entryFirst day jitters? He also very successfully dodged the many questions about our country's unreasonable drug policies. What a scumbag. ?????????????????? ?why is are President a monkey?????????????????????????????? ??????????????? how did a monkey get elected president for the united states.? Why can't you spell "our"? Would you be a better candidate? Thanks Trace, Any time the president can connect with the people it is a good thing. He dodged the real H1-B visa question by accepting ONE resume'? He has the power to free-up 100,000 high-tech jobs with the stroke of a pen, and he thinks looking at ONE resume' is the solution? There's no reason for an H1-B program when unemployment among Americans is this high. I agree. I have over 24 years experience and am a recognized leader in my field, yet I am being forced to train my Indian replacements. They are earning 50% of my salary. I am not sure how Capital One gets away with it. It seems illegal. And it is definitely unpatriotic. Where do I send my resume Mr. President? I question the validity of Mrs. wedels unemployed husband... No work? Texas has the lowest unemployment rate when compared to the national average. If her husband hasn't worked in the three years it because he has chosen not to. In 3 years he would have been able to sharpen his skills or start a new profession because his resume doesn't reflect what hiring managers want for semi conductor engineers. I went unemployed during the last presidential election for 6 months as no one was hiring as they were waiting to see who would be elected. I found a 6 figure salary in February 2010 and recently left that job for a better one... In the time is was looking for I job, I was a substitute teacher, tutor, sports official, started my own business and what ever else I needed to be to take care of my family. I thought it was ignorant of her to say that she would doesn't know if she would vote for this President again even if her husband were to get his assistance with work...goes to a theory of entitlement us Americans show or stupidity with. We should not have to learn a new career when they are bringing in 1000's of incompetent people from India to take the jobs for which we are qualified and have been working for many years. I am not a slacker. I work hard and do a very good job. I have had exemplary performance reviews... exceeding expectations and a role model. But the company sees they can save money by playing the game within the H1B visa system. To them a resource is a resource...not a person with a family and responsibilities. Companies used to focus on long-term growth and long-term objectives. Pressure from Wall Street to improve next quarter's earnings is driving companies to look no farther ahead than their next quarterly earnings report. A few years ago, that meant shedding jobs then overworking the remaining employees. Now it means bringing in foreign labor to replace ALL the IT staff. Don,And why limit yourself to "taking out" only oigefrn problems?The same philosophy can be applied domestically. Why bother with nicities like elections and such? Just "take out" the opposition.Uncle Joe would be proud! Your ability to find a new job is great. Many, many others are not finding it so great. The trouble with individual anecdotes like yours and Mrs. Wedel's is that they obscure the larger picture. That larger picture is not pretty. Even a recent GAO report found as much as 18% of all H1-B visa applications were faulty. The biggest errors are not paying the prevailing wage, or not working for the employer who sponsored the visa. The Congress tied an H1-B visa limit to the 2009 federal stimulus package for banks and financial institutions. It's time we did the same for the other industries that are 'outsourcing' their IT work. The companies with the most H1-B visa applications are 'staffing' companies – they get their visas approved, then 'shop' the employees to other companies on a contract basis. It's tantamount to a federal subsidy for hiring foreign workers during our 'jobless' recovery. I'd also advise 'iceberg' to keep looking over his shoulder. The next H1-B candidate into the country might be there to take his job. Maybe the problem with the Stimulus Package provision is that banks are using consulting companies like Infosys and Cognizant to fill their staff with "onshored" H1B Visa Indians. When I walk down the hall I might pass 15 Indians and 5 non-Indians. At times I feel racist for pointing this out. But it is not right. Guest workers should not be taking our jobs. I also think that the replacements are doing a very poor job. We are asked to teach them the very basics...such as memo writing or a basic banking overview. They do the bare minimum and claim that they have performed the tasks. They don't have the years of banking experience. They don't see when something is missing. It will take a major snafu to call attention to this problem. I know this is a wonderful opportunity for these people and I do not fault them. I put all the blame on the banks.